We reported yesterday that Gilead Power is actively prospecting for landowners to lease 10,000 hectares of land for a wind power project. The citizens of Greater Napanee held a public information meeting last night. Note the comments from a landowner who has been approached numerous times by the aggressive wind power developer. Here is a report from local resident Bill Daverne. Tuesday night, the Town of Greater Napanee held an open council meeting dedicated to public input on the proposed Gilead Power 40-80MW Dorland wind power project. Dorland is to be sited in a 10,000-hectare swath of properties south and east of Hay Bay in the waterfront community in which Sir John A. Macdonald lived as a child, and which is today a mix of farms, residences and recreation properties. Lease acquisition is well underway, but no Feed In Tariff or FIT contract has been awarded. It became clear early on in the meeting held in the South Fredericksburg Hall that the full-house crowd of 250 to 300 was opposed to the proposal. At least 18 people spoke against Dorland; one person said he was for it, had signed a contract with Gilead, and didn’t “mind looking at wind turbine towers.” He said he already looks at the power towers running north from the Lennox Generating Station and “is used to them.” He admitted he had not had a lawyer examine the contract before he signed. Only local residents were allowed to speak, and those opposed covered the range of issues in detail. Al Curtis and Jim Barrie pointed out that Dorland was in the important Atlantic Flyway bird migration route and would lead to a mass slaughter of birds, as is already being experienced at the wind power project on Wolfe Island, across from Kingston. Wind turbine setbacks legislated in various jurisdictions around the world were shown, showing that Ontario has the smallest setback anywhere. 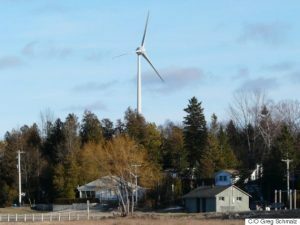 One speaker had calculated the impact of the proposed industrial wind turbines on property values was a conservative reduction of 25% while it was noted studies in Ontario, New York state and elsewhere have shown value declines of as much as 50%. The impact on people across narrow Hay Bay, facing the big turbines, was noted by people on both sides of the fish-rich waters. One woman said she rented out her cottage. “But who would want to rent it to look at wind turbines and listen to that sound,” she said. “They come for the quiet, and the birds.” Others pointed out that birds that weren’t killed would avoid the area, costing residents one of the local joys. When the room was asked who had visited Wolfe Islandto see the impact there, a lot of hands went up amid murmurs of disapproval. Others noted the loss of farmland was rarely discussed but given the setbacks and separation involved, a lot of his land would be lost to construction and maintenance roads. The developer demands 100% control over roads, siting, access, etc. and this would take control of drainage, woodlots and wildlife corridors out of his hands. He wants Council’s vote next week to be recorded, a sentiment supported and voiced by others as well. Much was also made about the fact wind power is surplus power and has been sold at a loss of $2 billion a year outside Ontario due to over-production. Early on, one speaker asked for a show of hands to see who was against the Dorland proposal and almost every hand went up. The message was clear. Those assembled want Council to declare Greater Napanee as an ‘Unwilling Host’ next week. It seems the people of Greater Napanee have their act together and understand the anti-social impact industrial wind turbines killing their way of life. Pleased to see that the local citizens have come together for the benefit of the community. Good luck.